← CAUTION- Rainforest destruction in your treat bag? Hope everyone had a fun and palm oil free Halloween. 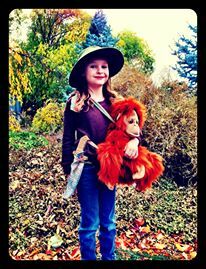 Young Junglehero Gigi Finn dressed up as Birute Galdikas, the founder of OFI, a conservationist, primatolagist, and hero for orangutans. Gigi handed out papers with information about orangutans and Jungleheroes to raise awareness. We think this is fabulous! How did you make your Halloween orangutan-friendly? Jungleheroes can present at your school! Click to "adopt" an orangutan today! Click to sponsor orangutan habitat today! CAUTION- Rainforest destruction in your treat bag?